MEMBERS: Ishikawa Hiroya (Vocals), Asabatake Suguru (Guitar), Saitou Hiroyuki (Drums). Hayashi Keita was the group's bassist, and left in October 2006. 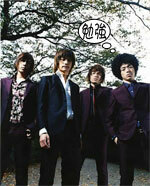 This group is best known for a few of their songs being used as theme songs to popular anime series.